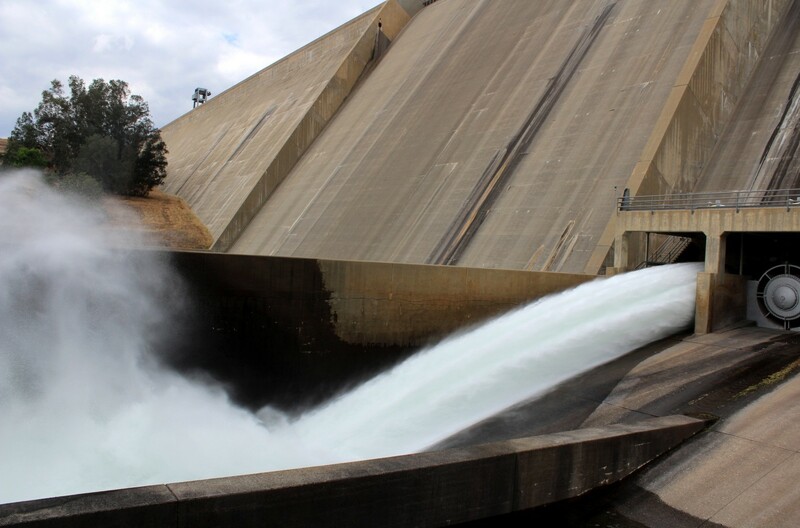 Friant water thunders into the San Joaquin River from Friant Dam and makes history as it is released for downstream water rights holders. Zero remains the frustrating word for Friant Division growers who continue to have no Central Valley Project water to use and, in many cases, little or no groundwater available to tap in their desperate efforts to save increasingly moisture-stressed permanent plantings along the south valley’s East Side. The U.S. Bureau of Reclamation’s zero water supply declaration remains in effect for the Friant Division, even as Reclamation increases the Friant Project’s first-ever CVP supply releases to get water to the San Joaquin River’s senior water rights holders downstream, the Exchange Contractors, even though the Bureau has other sources from which to make the exchange supply available. A Friant Water Authority news release, which gained some national news coverage May 15 when the river releases started, said that date was probably “the darkest and most frustrating day in the eastern San Joaquin Valley’s long and complicated water history” and laid the blame squarely on federal regulatory factors that did not exist in the past’s worst drought events. The view of Terra Bella’s landscape is changing quickly as more and more citrus trees are removed. The district lacks any groundwater and has a zero allocation from the Friant-Kern Canal. 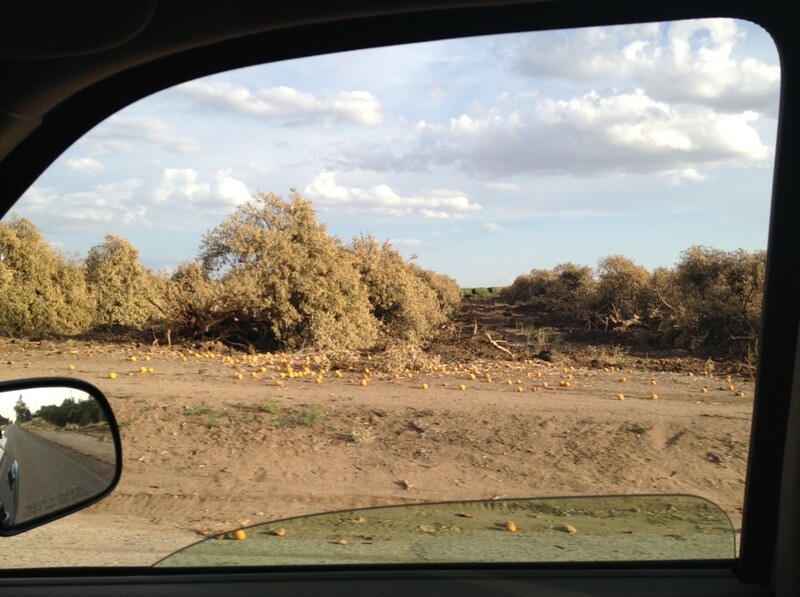 In districts along the Friant-Kern Canal with no usable groundwater and which rely entirely on CVP water diverted at Friant Dam from the San Joaquin River, ever-increasing numbers of permanent plantings – mostly orange trees – are already being taken out as more and more growers bow to what they see as the inevitable. Tens of thousands of acres covered by trees remaining in those districts are doomed to die by late summer if they receive no water. Also promising to wilt are economies of dozens of farm communities and rural areas as jobs are lost, lives and opportunities are uprooted along with trees, and local and regional business, social and civic institutions also find their means of support lost. A preliminary estimate of losses in just the citrus industry alone has been listed at some $3 billion over the next five years, including crop losses, removal of groves, preparations for replanting and waiting for young trees to commercially produce. Friant’s dispute with the United States government over how Reclamation is managing the river system’s complex water exchange reached the tipping point May 15 when the Interior Department agency began sending water down the river after Reclamation announced it was “unable” to provide the Exchange Contractors with their substitute supplies of Delta water. 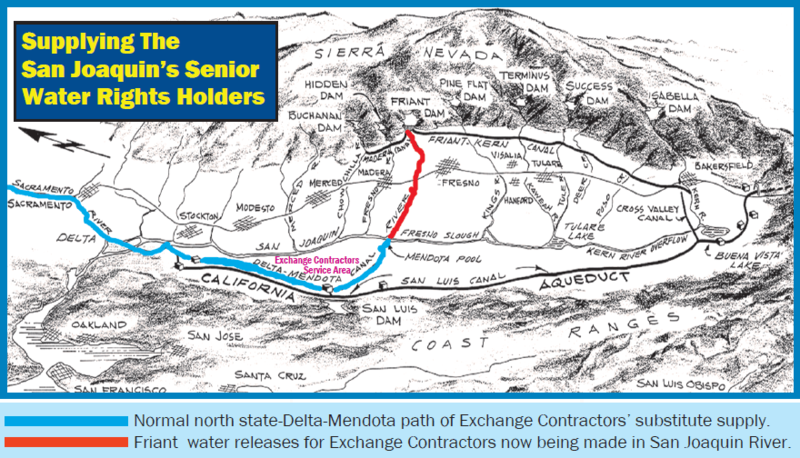 That substitute water for the better part of the last seven decades has made possible Friant-Kern Canal and Madera Canal diversions at Friant Dam, as agreed upon in decades-old CVP contracts. The Friant Water Authority has made it clear its members fully respect and abide by the Exchange Contractors’ senior water rights, which date back to 19th century filings by the historic cattle firm Miller & Lux. However, Reclamation has more than 200,000 acre-feet of CVP water stored in San Luis Reservoir and is also maintaining increased CVP storage in Lake Shasta. The Bureau decided to use some of these supplies for south-of-Delta wildlife refuges, which primarily benefit migratory waterfowl such as ducks, rather than supplying it to the four agencies known as the San Joaquin River Exchange Contractors. Refuges are to receive 178,000 acre-feet, and Reclamation estimates that it will provide the Exchange Contractors with 529,000 acre-feet from April through October, using a combination of the CVP’s San Joaquin River supplies and north state water pumped from the Delta. Lake Shasta storage continues to be enhanced by a few hundred thousand acre-feet of water that the National Marine Fisheries Service has stubbornly reserved under a biological opinion for cold water preservation to benefit Chinook salmon later this year. Friant believes there is no evidence that Reclamation has ever requested consultation on its mandatory performance of the Exchange Contract, and thus, there is no basis for withholding this water under an inapplicable biological opinion. This third year of critical drought conditions has dramatically reduced natural San Joaquin River runoff, meaning that the water Reclamation is releasing to the Exchange Contractors is permanently lost to Friant Division use. Projections are that the river releases may consume most of the river’s remaining supply. The San Joaquin River Restoration’s interim flows were suspended in February because of the drought and are not currently a factor in the lack of Friant supply availability. Ironically, the San Joaquin River water now being released has always been at the heart of the Friant Division’s supply. In the late 1930s, Reclamation signed a “purchase agreement” and an “exchange of waters” agreement, enabling the agency to divert water at Friant Dam. In exchange, the Bureau agreed to provide the territory formerly within the massive ranch of the old cattle firm Miller & Lux with a substitute supply of water from the Delta, delivered through the Delta-Mendota Canal. The old Miller & Lux rights continue to exist and belong to the Exchange Contractors.